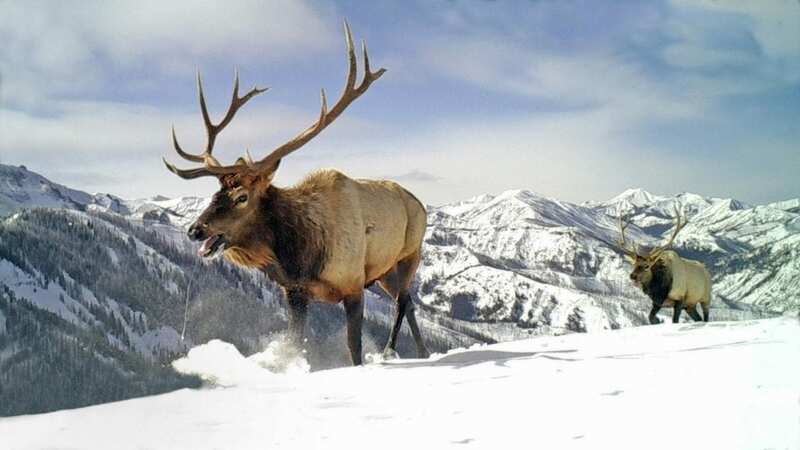 The first-ever atlas of ungulate migration was released this week, detailing the ecology and conservation of migratory big-game species including mule deer, elk and pronghorn in Wyoming, the greater Yellowstone ecosystem and adjacent Western states. "Wild Migrations: Atlas of Wyoming's Ungulates" is a result of a six-year collaboration between wildlife biologists at the University of Wyoming and cartographers at the University of Oregon. The book also draws on the longtime experience and expertise of wildlife managers with the Wyoming Game and Fish Department and other experts and historians from around the West. The project uses state-of-the-art animal movement data and cartography to visualize migrations of animals across complex and changing landscapes. Over the last two decades, technological advancements in GPS satellite tracking collars have made it possible for researchers to track animals and pinpoint locations every couple of hours for multiple years — greatly improving scientific understanding of wildlife migration. Now, the maps in "Wild Migrations" draw on dozens of such GPS collar studies, revealing the animals' finely choreographed movements as they migrate in response to weather and environmental conditions, season by season. "A theme that emerges from the hundreds of maps we created for the atlas is how these animals have perfectly tuned their movements to the landscapes and seasons where they live," says lead author Matthew Kauffman, a U.S. Geological Survey (USGS) researcher based at UW. Maps and associated infographics show how mule deer time their migrations into the mountains to match the pace of the spring green-up; how the cultural knowledge of moose tells them how long to wait for snow to melt before starting migration; and how Yellowstone bison refashion their movements in winters when they encounter deep snow. These are just a few examples of the new ecological understanding illustrated through beautiful maps in the book. "Throughout this project, I have been amazed at how many different factors shape the ways these animals move across Wyoming's big landscapes," says Jim Meacham, the lead cartographer on the project. "The challenge for our team was to figure out which elements of the landscape, and of the animals' movements, needed to be on each map to best tell the story the science had revealed." The resulting maps, created through close collaboration between Meacham's team and wildlife biologists, tell story after story of scientific discovery and management challenges, making the emerging understanding of migration accessible to a broad readership. The landscapes of the American West are changing, as the book makes clear. Maps in the "Threats" chapter depict how roads, fences, subdivisions and energy development are incrementally cutting up vast landscapes and sometimes creating barriers to wildlife movement. "Our primary impetus in creating this book was to help inform the conservation challenge that lies ahead," Kauffman says. "'Wild Migrations' grew out of the idea that, if we made better maps of the migration corridors these herds depend on, we could do a better job of conserving them." In addition to the map illustrations, "Wild Migrations" uses stunning color images from National Geographic photographer Joe Riis, the Wyoming Game and Fish Department's Mark Gocke and other photographers, along with written accounts, to tell the larger story of Wyoming's migratory herds. A series of essays by natural history writer Emilene Ostlind, who once famously hiked the 100-mile "Path of the Pronghorn," is woven through the book. Her essays paint scenes that are hidden within the book's maps — a hunter on a crisp fall morning, a deer migrating home for winter, the conservation ethic of a local rancher. Co-authors of "Wild Migrations" are Kauffman, Wyoming Cooperative Fish and Wildlife Research Unit director; Bill Rudd, former Wyoming Game and Fish Department biologist and co-founder of the Wyoming Migration Initiative; Meacham and Alethea Steingisser, cartographers at the University of Oregon InfoGraphics Lab; Hall Sawyer, research biologist with Western EcoSystems Technology; and Ostlind, editor and science storyteller at the Ruckelshaus Institute in UW's Haub School of Environment and Natural Resources. Renowned novelist and former Wyoming resident Annie Proulx — a keen observer of the state's people, wildlife and wild places — contributed the book's foreword. Major sponsors of the book include the Knobloch Family Foundation, the George B. Storer Foundation and the Biodiversity Institute at UW, among many others. Unit and biologists with the Wyoming Game and Fish Department. Biologists at Yellowstone and Grand Teton national parks, the Bureau of Land Management, the U.S. Forest Service, the U.S. Fish and Wildlife Service, the USGS, The Nature Conservancy and many others contributed data and expertise to the project as well. "Wild Migrations" was published by Oregon State University Press and can be purchased at http://www.osupress.oregonstate.edu/book/wild-migrations. To request a review copy, email Marty Brown at [email protected] or call 541-737-3866. For more information and updates, follow the Wyoming Migration Initiative on Facebook at http://www.facebook.com/migrationinitiative, Twitter @wyo_migrations or Instagram @migrationinitiative.